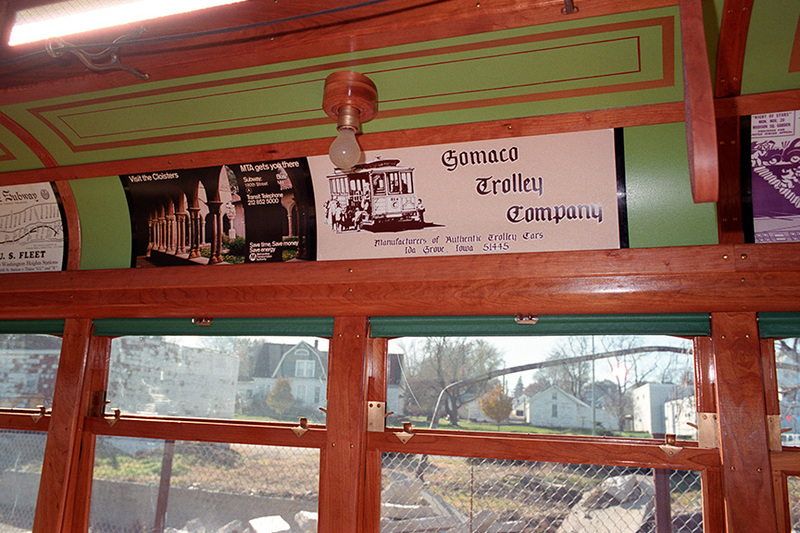 Gomaco Trolley Company built the first closed, double-truck trolley car in the United States since the early 1900s. 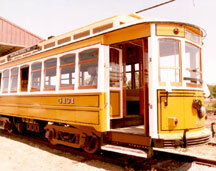 This authentic replica has been operating since 1986 in Lowell, Massachusetts, at the Lowell National Historical Park. 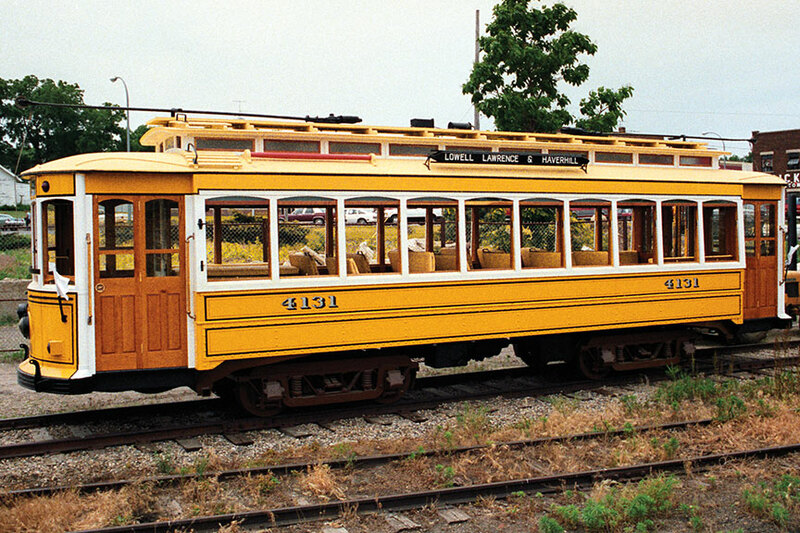 This car is an authentic reproduction of the 4100 series car manufactured by St. Louis and Laconia Car Company for the Bay State Railway in the early 1900s. 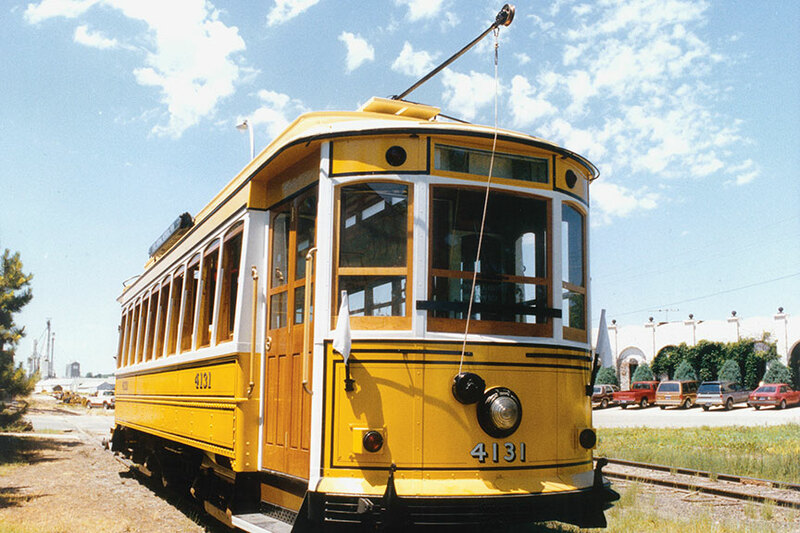 Historical accuracy and attention to details were key factors in the production of this car. 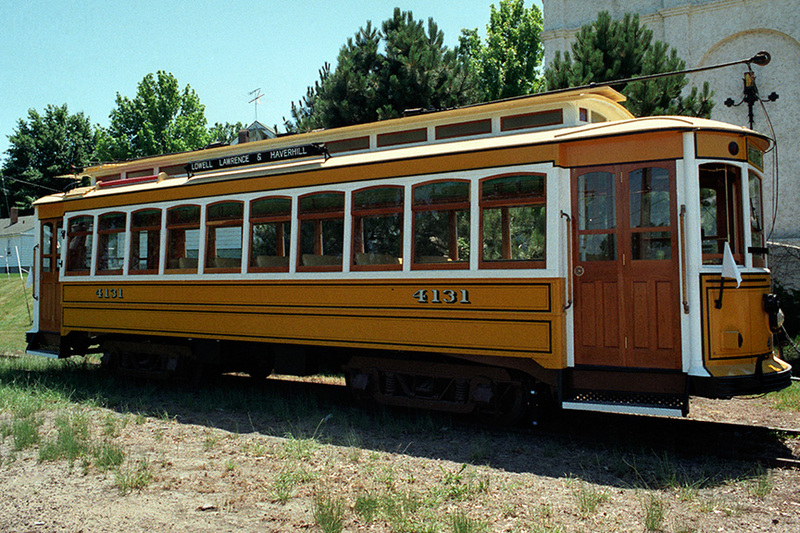 Car Numbers: #4131 - Lowell Historic Preservation Commission, US Department of the Interior. 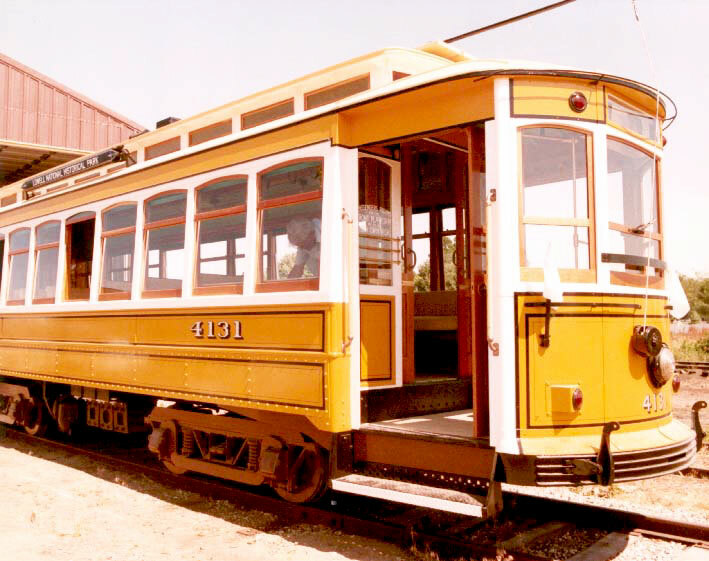 Running Equipment: MV 101 GE motors, 40 hp, 600 volts, air brakes, and CP27 compressor. 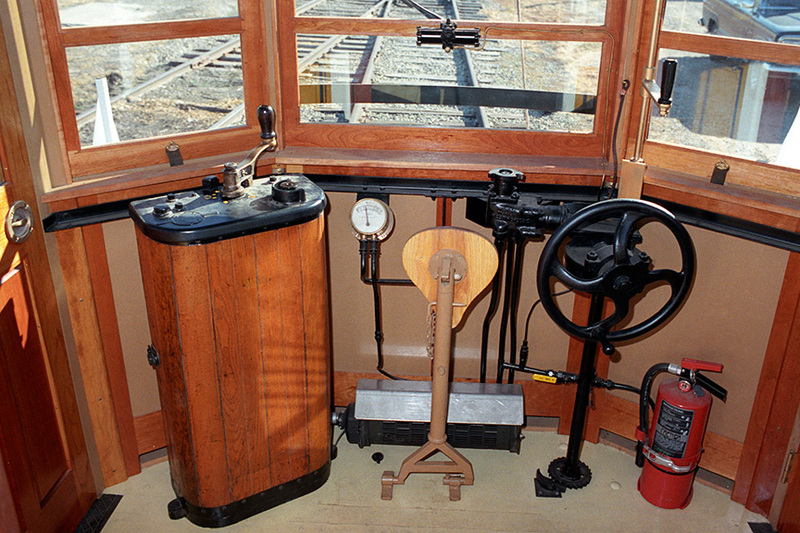 Controls: General Electric K35 controllers. Seating: 40 sitting, 25 standing (based on six people per square meter). Total Crush Load: 65 people (does not include the operator). Seats: Cane seats. 12 rollover. Four stationary corner seats. Woods: Window sash and interior trim and doors - cherry. 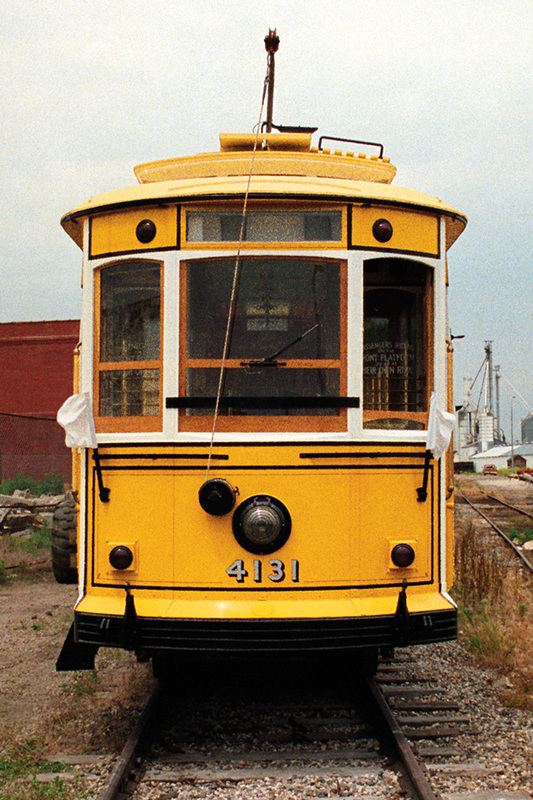 Paint: Yellow, with white trim. 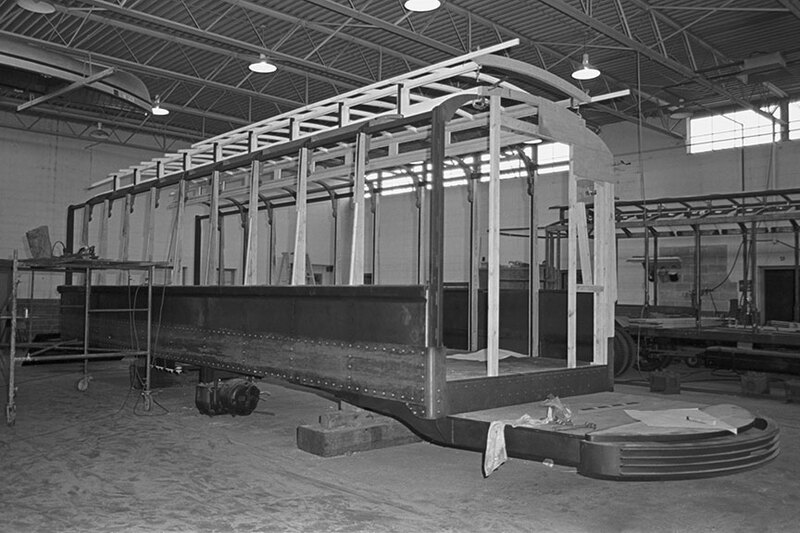 Color and details are selected by customer. Clerestory Glass: Clear red at ends, except center, white glue glass on sides. 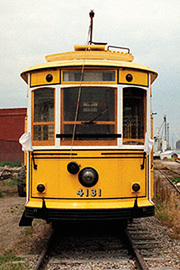 Lights: 11 interior, 2 General Electric Company headlights from Melbourne, Australia, and one portable arc light by Gomaco Trolley Company. Steps: Four permanent-mounted steps. One at each corner door entry. Floor: Plywood subfloor with grooved maple boards on wearing surfaces. Douglas fir under seats. Ceiling: 1/8 inch birch plywood, painted and hand pin striped. 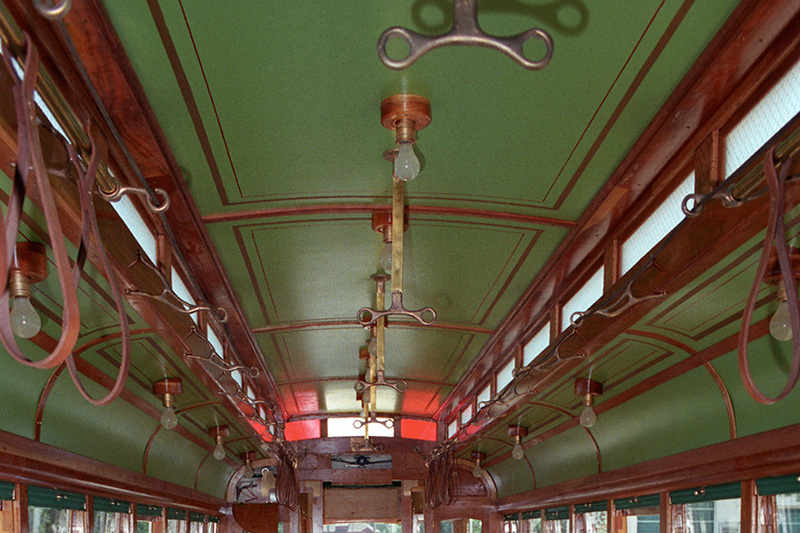 Floor plan for the semi-convertible, enclosed trolley. 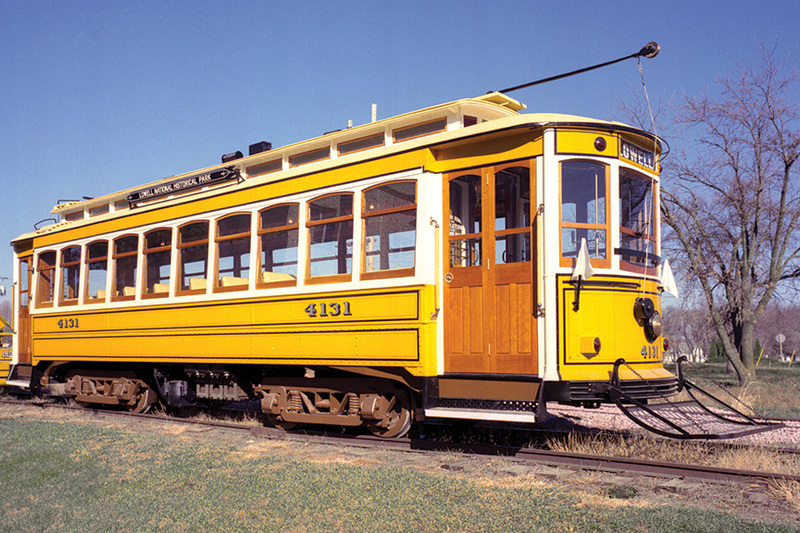 Trolley #4131 is prepared for a day of transporting guests around the Lowell National Historical Park in Massachusetts. 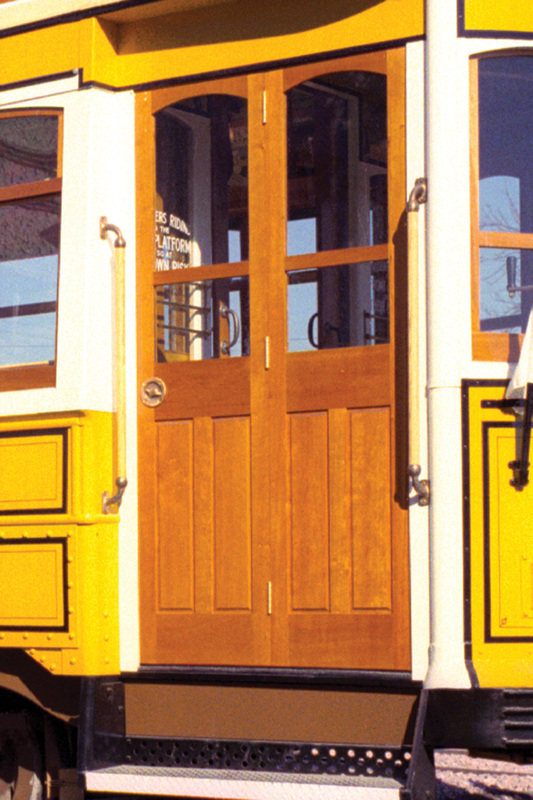 Each trolley has a permanent-mounted step at each of the four corner entrances. 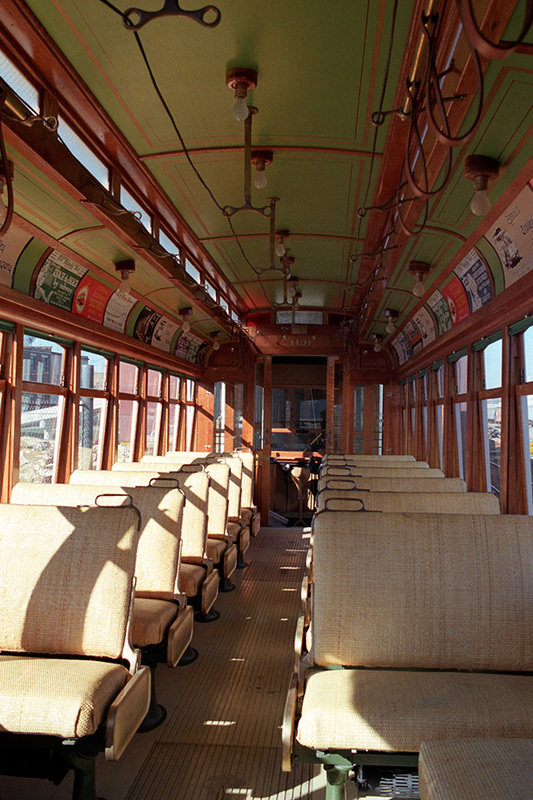 The interior of the semi-convertible, enclosed trolley is constructed of numerous types of high-quality wood, and contains 12 rollover cane seats. 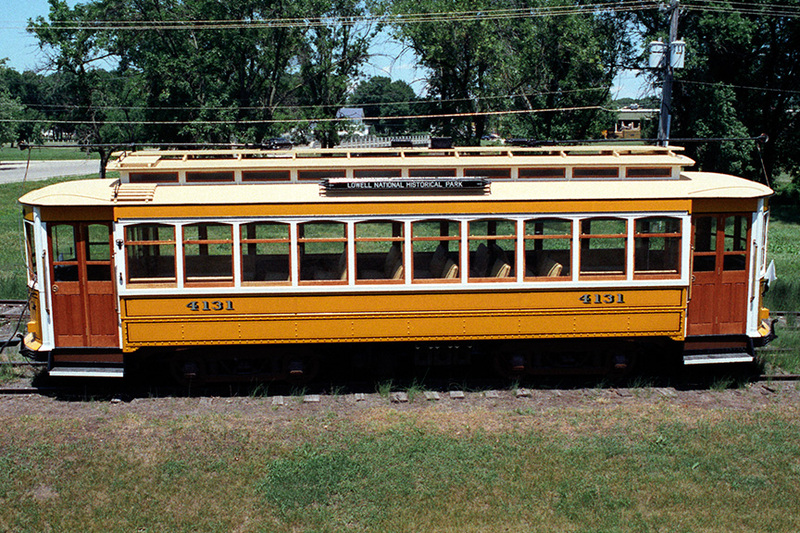 Trolley #4131 has a plywood roof with a painted canvas cover, and 14 windows on each side for guests to take in the sights of the Lowell National Historical Park. 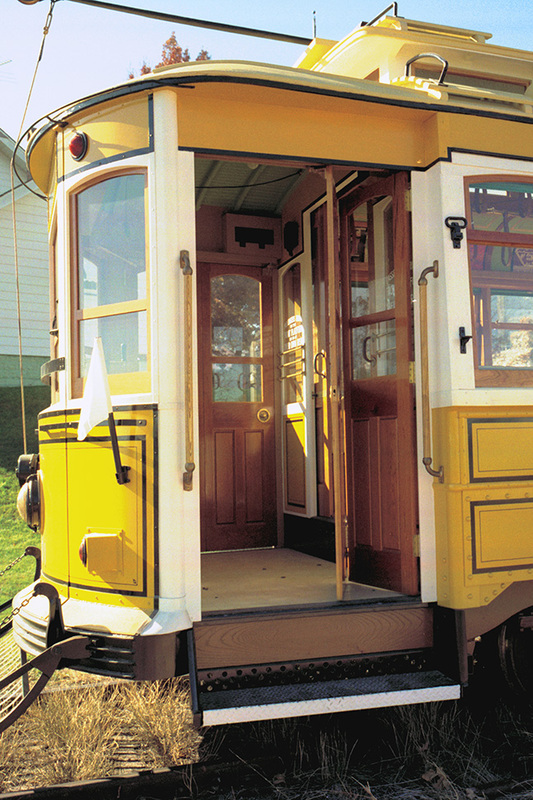 This trolley operates at speeds up to 30 mph, and holds a maximum of 65 passengers, 40 sitting and 25 standing. 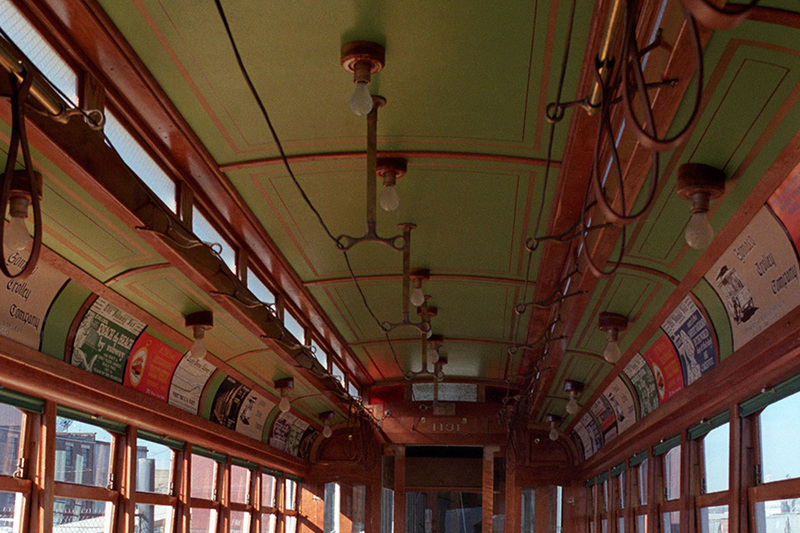 Panels for advertising line the edge of the ceiling on both sides of the trolley. 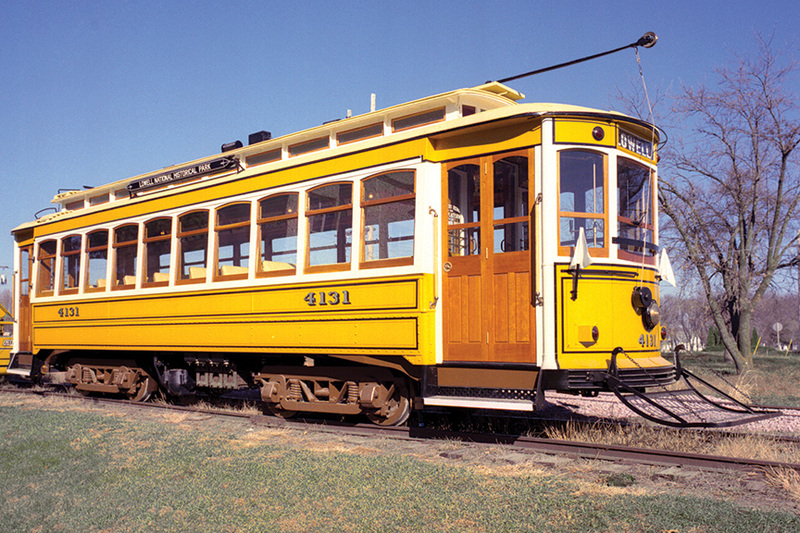 Semi-convertible, enclosed trolley #4131 is tested on the rails in Ida Grove, Iowa, prior to being transported to Lowell, Massachusetts.